BACKGROUND: Acute exacerbations of bronchial asthma remain a major cause of frequent Emergency Department (ED) visits by pediatric patients. However, other factors including psychosocial, behavioural and educational, are also reportedly associated with repetitive ED visits. Therefore, it is necessary to determine whether such visits are justifiable. OBJECTIVE: The objective of this cross-sectional study was to identify risk factors associated with visits to ED by asthmatic children. METHODS: Asthmatic children (n = 297) between 1-17 years old were recruited and information collected at the time of visiting an ED facility at two major hospitals. RESULTS: Asthmatic patients visited the ED 3.9 ΁ 3.2 times-per-year, on average. Inadequately controlled asthma was perceived in 60.3% of patients. The majority of patients (56.4%) reported not receiving education about asthma. Patients reflected misconceptions about the ED department, including the belief that more effective treatments are available (40.9%), or that the ED staff is better qualified (27.8%). About half of patients (48.2%) visited the ED because of the convenience of being open 24 hours, or because they are received immediately (38.4%). Uncontrolled asthma was associated with poor education about asthma and/or medication use. Patients educated about asthma, were less likely to stop corticosteroid therapy when their symptoms get better (OR:0.55; 95% CI:0.3-0.9; P = 0.04). CONCLUSION: This study reports that most patients had poor knowledge about asthma and were using medications improperly, thus suggesting inefficient application of management action plan. Unnecessary and frequent visits to the ED for asthma care was associated with poor education about asthma and medication use. Potential deficiencies of the health system at directing patients to the proper medical facility were uncovered and underline the necessity to improve education about the disease and medication compliance of patients and their parents/guardians. Several meta-analysis studies have suggested that improper use of medications such as long-acting beta-2 agonists (LABA) as single therapy increases the risk of asthma-related hospitalizations and mortality. ,, Various studies have suggested that when the patient is given instructions and proper education on asthma disease, mild attacks can be managed at home and thus decrease significantly the number of days per month with daytime asthma symptoms.­  Recently, a Canadian study confirmed that asthmatic patients referred to the Asthma Education center presented significantly lower rates of visits to both primary care and ER in the first year after referral. Also, a Brazilian study demonstrated the effectiveness at significantly decreasing ED visits when the patients were treated with medications and followed a wide prophylactic management program based on GINA guidelines. Therefore, educating the patient about management and control of disease symptoms at home is key to decrease unnecessary visits and use of resources of the ED while directing the patient to a primary care facility. On the other hand, ensuring a regular follow up appointment with the primary care physician or pediatrician can also decrease repetitive ED visits in the future and improve medication compliance. Identifying the major factors that move the patients to visit the ED rather than alternative medical care centers remains a matter of current interest, particularly when considering that some studies reported a negative correlation between rates of ED visits and hospital admissions. In Saudi Arabia, several studies have identified some risk factors that are associated with the frequency of ED visits by asthmatic adults; ,, however, studies of this kind on asthmatic children are rare. Given that in the adult Saudi population, the major risk factors associated with frequent ED visits were a lack of education about asthma and uncontrolled symptoms, , our hypothesis was that deficient education about asthma and medications, along with other clinical-demographic factors, could be associated with increased pediatric ED use for asthma treatment. b. Age group above 1 years and less than 18 years. In accord with our objectives, we recruited any children visiting the ED regardless of their asthma condition. c. Patients having other lung co-morbidities, including congenital (e.g., cystic fibrosis) and airway infections. Two trained interviewers administered a questionnaire to the adult caregiver (usually one or both parents) accompanying the asthmatic child; this questionnaire was previously reported in a cross-sectional survey aiming to identify factors leading to frequent ED admissions of adult asthmatic patients from Saudi Arabia. The information collected included: General demographic characteristics (e.g., age; gender; schooling level); clinical data (e.g., where they had their regular visits for medical check-ups; how many times they visited the ED over the last year; whether they were hospitalized; duration of illness; medication used for asthma therapy); whether the patient/caregiver received formal education about asthma as a disease, about use of medicines and inhalers, and about management of symptoms; whether the patient/caregiver knows environmental triggers; what are the reason(s) for using the ED for asthma care; which prescription received during the ED visit; which care facility was referred by the ED. In addition, a validated Arabic version of the Asthma Control Test questionnaire (ACT) , was administered to determine the score for symptoms control of each patient over the last month; the scores in this test ranged from 5 (not controlled) to 25 (best controlled). All analyses were performed using the SPSS software package version 19 (IBM), or the Prism software (GraphPad). Descriptive analyses of the clinical and demographics data were performed, such as means, medians, standard deviations and percentages. For those grouping variables that significantly influenced frequency of visits to a care facility, Chi-square tests of independence were performed to test the associations of the dichotomous variables clinical, demographic and the factors explored (Yes/No questions). A logistic regression model was constructed to assess the association of >3 visits per year to the ED with demographic, clinical and other predictors, by using a forward selection method. Significance was set at P < 0.05; all P-values reported are Two-tailed. The mean age of the recruited children was 8.1 years old, with a standard deviation of ± 5.5 years; girls were more frequent (66.9%) than boys (33.1%) [Table 1]. In this cohort, 45.9% of patients were not attending any school, whereas those attending High-School were less numerous (6.7%). Classified according to GINA guidelines, the majority of patients interviewed were Intermittent (63.5%) or Mild Persistent asthmatics (27.6%) and only a small portion were Moderate Persistent asthmatics (9%); Severe persistent asthmatics were not found among this group of patients, despite our random recruitment procedure. The mean duration of asthma diagnosis was 5.3 ± 4.8 years (median: 3 years) at the time of the interview. According to Nathan et al.,  the ACT scores over the last month indicated that the majority of the cohort (60.3%) had their asthma symptoms inadequately controlled (score ≤19), whereas the remaining 39.7% had well controlled symptoms (score ≥20). An important portion (44%) reported not using inhaled corticosteroids (ICS); of those who did, 56% reported using it twice-daily, and 73% did use it as single medication. Most patients (92.5%) reported using a beta-2 adrenoceptor agonist, half of which (51.1%) did it as only therapy; only 17.5% of patients reported using both ICS and beta2-agonist. Within a period of one year, patients visited the ED 3.9 ± 3.2 times, on average; of these, the majority (61.6%) visited the ED ≥3 times, whereas 38.4% visited it <3 times [Table 1]. [Table 2] presents the dichotomous questions grouped by categories, with the number of patients' answers ('Yes' or 'No') indicated by 'N' and the corresponding percentages. In the category 'Education about Medication', 8 questions were dedicated to examine the patient's perception of the disease and the use of medication; only in question Q5, "Do you stop inhaled corticosteroids medication when your asthma symptoms are getting better? ", a large majority of patients (73.3%) answered 'Yes', which indicates improper disease management. Regarding the remaining 7 questions, answers of most patients (60% and above) reflected a rather good perception of medication use; it should be noted though, that a non-negligible portion of patients (35%), gave answers that indicated misconceptions and/or ignorance on the proper use of medication and inhaler devices. Specifically, 39.7% of patients reported to increase or initiate ICS therapy when an attack is perceived (Q6); a quarter of patients (26.6%) failed to demonstrate a proper use of the inhaler device when requested (Q8); furthermore, a similar proportion (27.4%) reported to ignore what triggers their asthma symptoms (Q1). In regards to 'Education about asthma' and management category, the data consistently supported the notion that most patients (56.4%), have little interaction with their physician, and therefore, may not have received formal advice on asthma as a disease and proper management. In particular, 91.6% of patients declared not to have a written treatment plan for asthma attacks (Q15); most patients did not discuss a plan to prevent (61.9%; Q13), to treat (65.7%; Q14) or to manage symptoms and exacerbations at home (59.6%; Q12). In addition, a relatively large proportion reported not receiving professional training/education on asthma (47.1%; Q10) and on medication device use (42.3%; Q11). In relation to 'Environmental triggers' category, an average of 45% of patients complained about environmental factors triggering symptoms; among these, passive smoking (76.6%; Q17) and bedroom carpets (75%; Q18) were signaled more frequently. Regarding 'Reasons for visiting the ED for asthma care' category, we explored 7 possible reasons by which the patient would prefer/choose visiting the ED, and help to understand the correct or wrong perception of the Emergency Department. In general, the data showed that this cohort was split between those with good or bad perception (55% and 45% on average, respectively). More specifically, patients who answered 'Yes' to Q20 ('ED medical staff is better qualified') and Q21 ('better treatments are available'), about 28 and 41%, respectively, demonstrated a misconception that the ED is the best place to treat asthma, even though general and specialized pediatricians are uniquely qualified to ensure a correct therapy. Answers provided evidence that nearly half of patients (48.2%) visit the ED due to the convenience of being open 24 hours (Q23), or because they believe to receive treatment immediately (38.4%; Q22). 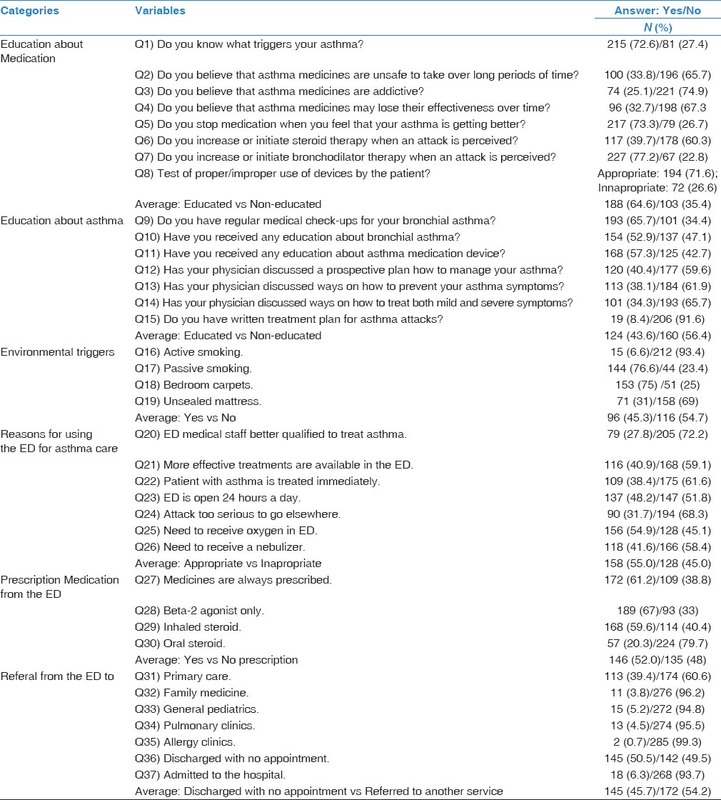 However, some patients may go to the ED for what it seems a valid reason (e.g., exacerbation); for instance, 54.9% of patients declared visiting the ED because they needed to "receive oxygen" (Q25), or to receive a nebulizer (41.6%; Q26), which indirectly suggests that these patients were experiencing an exacerbation; however, this could also reflect poor asthma education, because inhaled medications through an appropriate spacer device are as effective as nebulized medications and could be administered at home, following an asthma action plan. Outcome of the ED visit resulted in a prescription of medication (52% on average); of these, ICS (Q29) and bronchodilator (Q28) were prescribed for the majority of patients (59 and 67%, respectively), and less frequently for oral steroid (20.3%) (Q30). Patients were usually discharged (Q36) with no further appointment (50.5%), or were referred to a primary care (Q31) (39%), or were much less frequently admitted to the hospital (Q37) (6%) [Table 2]. The Asthma control test (ACT) was used as grouping factor to analyze its association with other variables. Patients with uncontrolled and controlled asthma were considered as ACT scores ≤19 and ≥20, respectively. Patients with uncontrolled asthma symptoms visited the ED more (4.02 ± 0.32 times on average), than patients with well controlled symptoms (3.1 ± 0.26 times on average; two-tailed P = 0.03*; unpaired T-test). [Table 3], shows the association between ACT (uncontrolled and controlled asthma) and variables of different categories. In the 'Education about Medication' category, patients who "increase or initiate ICS therapy when an attack is perceived" (Q6) were more than thrice as likely to have uncontrolled asthma, compared with patients with controlled asthma (OR = 3.65; 95% CI = 2.03-6.55). In addition, patients who responded negatively to the question "Do you use inhaled corticosteroids? ", had greater odds of having their symptoms uncontrolled (OR = 2.14; 95% CI = 1.24-3.69). These results are supported by the observation that many patients stop ICS when they feel that their symptoms improve (73.3%) [Table 2], which reflects a deficient knowledge on proper medication use; therefore, these patients are at greater risk of exacerbations and/or having uncontrolled symptoms. Of the 'Environmental triggers' category, only a significant relation between Bedroom carpets and uncontrolled asthma was observed (P = 0.008). Regarding the 'Reasons for visiting the ED for asthma care' category, patients with uncontrolled asthma were nearly twice as likely to do so because they believe that "more effective treatments are available" (Q21) (OR = 1.84; 95%CI = 1.08-3.14), or because the "ED is open 24 hours" (OR = 1.61; 95%CI = 0.92-2.79) (Q23). Tests of independence were performed to identify those variables associated with 'Education about asthma', using Q10, "Have you received any education about bronchial asthma? Yes/No", as 'dependent' variable [Table 4]. As expected, four of several variables found significantly associated with the dependent variable Q10, corresponded to 'Education about asthma' category. In particular, patients who acknowledged having a "written treatment plan for asthma attacks" (Q15), patients who have 'discussed a prospective plan to manage asthma" with their physician (Q12), or "discussed ways on how to treat mild and severe symptoms (Q14), or those who have "regular medical check-ups for bronchial asthma" (Q9), were highly likely of also having answered positively to Q10 (OR > 3; P < 0.01). Regarding 'Education about Medication' category, the data confirmed a positive relationship: educated patients about asthma were also more likely of having received education about medication; thus, patients who received professional education/advice about asthma, were at greater odds of using a bronchodilator (OR = 8.32; P < 0.01), or having knowledge of what triggers their symptoms (Q1) (OR = 1.75; P = 0.05). Contrary wise, patients who received education about asthma were less likely to wrongly believe that "medicines are addictive" (Q3) (OR = 0.56; P = 0.04), and were less likely to "stop medication when their symptoms improved" (Q5) (OR = 0.55; 95%CI = 0.3-0.9; P = 0.04). Concerning the category 'reasons for using the ED for asthma care', three variables were significantly linked with the dependent question. As expected, asthma educated patients were less likely to wrongly believe that the ED is the best place to treat serious exacerbations (OR = 0.56, P = 0.03). On the other hand, our analysis suggested that some patients who acknowledged receiving education about asthma also had a few incorrect viewpoints, such as that they visited the ED because of the belief that "the ED treats patients immediately" (OR = 2.26, P < 0.01), and that "the medical staff is better qualified to treat asthma exacerbations" (OR = 2.25, P < 0.01). In regards to the education-related question (Q11): "Have you received any education about therapy device use?" as dependent variable [Table 5], we confirmed that patients who did not receive education about proper inhaler device use, were more likely of not having received education about asthma (OR > 4, for Q9, Q12, Q13, Q14 and Q15; P < 0.01*). 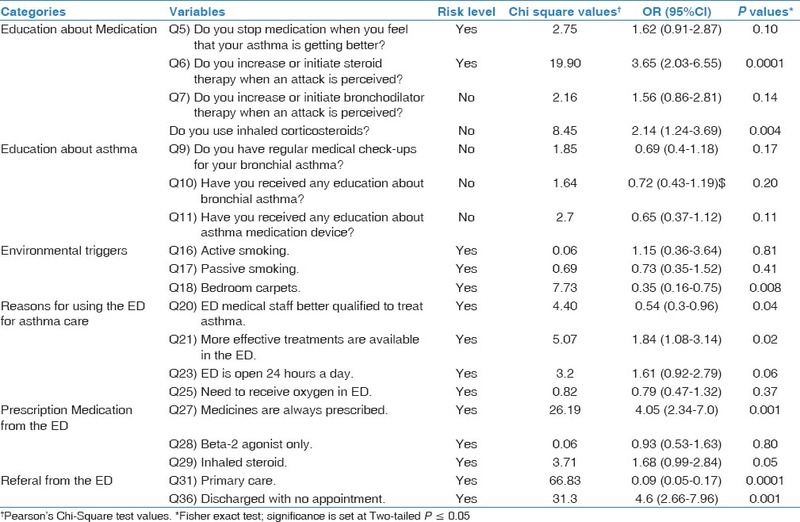 In addition, they were also more likely to stop their ICS medication when they felt their symptoms improved (OR = 2.52; P < 0.01*), and had misconceptions that influenced their decision to visit the ED, such as the belief that the ED medical staff is better qualified to treat asthma, that the ED is the best place to treat a serious attack, and that patients with asthma are treated immediately [Table 5]. A logistic regression model was constructed to assess the association of > 3 visits to the ED with demographic, clinical and other predictors [Table 6]. In this model, the following variables were positively associated (e.g., increased risk): the patient 'increases or initiates steroid therapy when an attack is perceived' (OR = 2.44); two reasons for using the ED for asthma care, namely "the ED is open 24 hours a day" (OR = 1.83), and "to receive a nebulizer" (OR = 2.29); the patient "has not discussed with the physician on ways to treat both mild and severe symptoms" (OR = 2.17). In the present survey involving a cohort of 297 asthmatic children, we sought to identify predictors that could explain why they choose to visit the ED for asthma care. Indeed, our data has revealed that asthmatic children tend to visit more frequently the ED, comparatively to the outpatient clinic and hospital; on average, these patients visited the ED 4 times per year; this frequency is comparatively similar to observations reported previously in both Saudi children and adults. , A characteristic of this cohort is their relative clinical homogeneity, composed mostly of patients with Intermittent (63%) and Mild (28%) disease (Severe asthma cases were absent), of which, only a quarter of them presented 'poorly' controlled symptoms (ACT score <15). Again, this evidence indicates that, in spite of their mild symptoms, these patients prefer to use the ED for care, resulting in over-crowding and poor utilization of its resources. Therefore, it seems evident that most of these patients could have received better management for asthma in the primary care setting. Importantly, our study pointed out that factors regarding both 'education about asthma' and 'education about medication', influenced significantly on their decision to go to the ED. Specifically, a majority of patients (56.4% on average) admitted not having received education about asthma as a disease, and had not discussed any plans with their physician on ways to prevent, to treat, and to manage symptoms at home. Also, an important proportion of patients (35.4% on average) recognized not having received professional advice on the use of medication, and about a quarter (26.6%) of this cohort failed to show a correct use of the inhaler device. Therefore, it should be expected that patients without proper education would be at greatest risk of developing exacerbations or having uncontrolled symptoms. Our data appeared to confirm that view: 60% of patients were declared with inadequately controlled symptoms (ACT scores ≤19), and about 25% had poorly controlled asthma (ACT scores <15). These patients were more likely to have wrong perception or ignorance about use of medication, as well as lack of knowledge on how to treat asthma symptoms in general. Furthermore, patients who showed inappropriate use of inhaler devices were at greater odds of visiting the ED, comparatively to those with appropriate technique. Consistent with our findings, a recent study on Saudi adult asthmatics concluded that higher frequency of ED visits was associated with improper use of asthma inhaler devices. 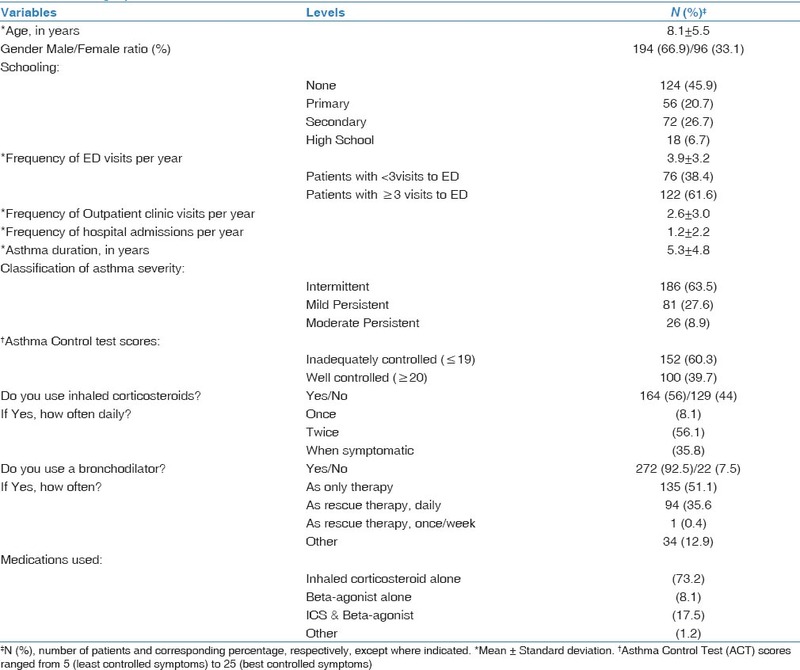 In addition, our analysis also identified some of the factors related to 'reasons to visit the ED for asthma care', that significantly influenced on patient's decision; patients with no education had the wrong opinion that the ED was better because the "medical staff is better qualified" or because "more effective treatments for asthma were available"; they also recognized visiting the ED because of the convenience of "staying open 24 hours a day". It should be mentioned that, although some patients received education in several aspects, they also displayed some misconceptions similar to non-educated asthmatics; specifically, they believed that the "ED medical staff is better qualified", and that "asthma patients are treated immediately". Therefore, these observations support the hypothesis that this subpopulation could be using the ED as they would visit a primary clinic, because of some wrong perception, or for the convenience that they are received immediately, and not necessarily (but not ruled out) for reasons related to exacerbations or uncontrolled symptoms. The main strength is that this study provides evidence for the first time of the importance of education about asthma and medicine use in asthmatic children from Saudi Arabia. The Sample size, which was randomly recruited, was large enough to encompass children of all ages between 1 and 17 years old. As for limitations, we did not find Severe persistent asthmatics, which could suggest either biased sampling or that very few children of that category visit the ED. Another potential limitation of this study is its dependence on the accuracy of the answers provided by the parent/guardian accompanying the asthmatic patient; also, interviewers could not always obtain an answer for some of the questions, for reasons not explained. Furthermore, our findings do not imply that all ED visits are accounted for non-educated patients; rather, our data indicate that both educated and non-educated patients are visiting this facility. This survey, one of the very few performed to study asthmatic children from Saudi Arabia, helped to identify education of asthma as a disease and medication compliance as critical determinants, which need improvement. Overall, valuable information from this survey was obtained, which may help suggesting improvements on the Saudi medical system and to direct children patients to the proper medical care facility. Taking together, both non-educated and educated patients (and/or their parents) could avoid visiting the ED and instead seek medical attention in a primary clinic or specialized facility. ,, Both the Global Initiative for Asthma (GINA), , and its equivalent in Saudi Arabia, the Saudi Initiative for Asthma (SINA),  recommend regular follow ups and to discuss action plans as essential steps in managing asthma. However, whether these guidelines are efficiently followed by physicians and pulmonologists, requires further investigation. Masoli M, Fabian D, Holt S, Beasley R. Global Initiative for Asthma (GINA) Program. The global burden of asthma: Executive summary of the GINA Dissemination Committee report. Allergy 2004;59:469-78. Al Frayh AR, Shakoor Z, Gad El Rab MO, Hasnain SM. Increased prevalence of asthma in Saudi Arabia. Ann Allergy Asthma Immunol 2001;86:292-6. Al-Jahdali H, Anwar A, Al-Harbi A, Baharoon S, Halwani R, Al Shimemeri A, et al. Factors associated with patient visits to the emergency department for asthma therapy. BMC Pulm Med 2012;12:80. Al-Yami SM, Mohajer KA, Al-Jeraisy MI, Batarfi AM, Abolfotouh MA. Recurrent visits and admissions of children with asthma in central Saudi Arabia. Saudi Med J 2010;31:921-4. Wasilewski Y, Clark NM, Evans D, Levison MJ, Levin B, Mellins RB. Factors associated with emergency department visits by children with asthma: Implications for health education. Am J Public Health 1996;86:1410-5. Adams RJ, Smith BJ, Ruffin RE. Factors associated with hospital admissions and repeat emergency department visits for adults with asthma. Thorax 2000;55:566-73. Kim H, Kieckhefer GM, Greek AA, Joesch JM, Baydar N. Health care utilization by children with asthma. Prev Chronic Dis 2009;6:A12. Jones R, Lin S, Munsie JP, Radigan M, Hwang SA. Racial/ethnic differences in asthma-related emergency department visits and hospitalizations among children with wheeze in Buffalo, New York. J Asthma 2008;45:916-22. Centers for Disease Control and Prevention: Asthma prevalence, health care use and mortality: United States 2003-05. Available from: http://www.cdc.gov/nchs/data/hestat/asthma03-05/asthma03-05.htm [Last accessed on 2014 May 3]. Walsh-Kelly CM, Kelly KJ, Drendel AL, Grabowski L, Kuhn EM. Emergency department revisits for pediatric acute asthma exacerbations: Association of factors identified in an emergency department asthma tracking system. Pediatr Emerg Care 2008;24:505-10. Ungar WJ, Paterson JM, Gomes T, Bikangaga P, Gold M, To T, et al. Relationship of asthma management, socioeconomic status, and medication insurance characteristics to exacerbation frequency in children with asthma. Ann Allergy Asthma Immunol 2011;106:17-23. Patel MR, Brown RW, Clark NM. Perceived parent financial burden and asthma outcomes in low-income, urban children. J Urban Health 2013;90:329-42. Oraka E, Iqbal S, Flanders WD, Brinker K, Garbe P. Racial and ethnic disparities in current asthma and emergency department visits: Findings from the National Health Interview Survey, 2001-2010. J Asthma 2013;50:488-96. El-Saify MY, Shaheen MA, Sabbour SM, Basal AA. Nocturnal attacks, emergency room visits and ICU admission of pediatric asthma: Frequency and associated factors. J Egypt Public Health Assoc 2008;83:352-67. Reddy AP, Gupta MR. Management of asthma: The current US and european guidelines. Adv Exp Med Biol 2014;795:81-103. Mysore S, Ruffin RE. Long-acting β-agonists in asthma management: What is the current status? Drugs 2011;71:2091-7. Côté J, Cartier A, Robichaud P, Boutin H, Malo JL, Rouleau M, et al. Influence of asthma education on asthma severity, quality of life and environmental control. Can Respir J 2000;7:395-400. Gaudreau K, Stryhn H, Sanford C, Cheverie C, Conklin J, Hansen J, et al. Use of emergency departments and primary care visits for asthma related conditions in the 3 years following an asthma education program. J Asthma 2014;51:288-93. Fontes MJ, Affonso AG, Calazans GM, de Andrade CR, Lasmar LM, Nader CM, et al. Impact of an asthma management program on hospitalizations and emergency department visits. J Pediatr (Rio J) 2011;87:412-8. Fuhrman C, Dubus JC, Marguet C, Delacourt C, Thumerelle C, de Blic J, et al. Hospitalizations for asthma in children are linked to undertreatment and insufficient asthma education. J Asthma 2011;48:565-71. Butz A, Sellers MD, Land C, Walker J, Tsoukleris M, Bollinger ME. Factors affecting primary care provider and caregiver concordance for pediatric asthma medications. J Asthma 2009;46:308-13. Michelson KA, Monuteaux MC, Stack AM, Bachur RG. Pediatric emergency department crowding is associated with a lower likelihood of hospital admission. Acad Emerg Med 2012;19:816-20. Al-Jahdali H, Ahmed A, Al-Harbi A, Khan M, Baharoon S, Bin Salih S, et al. Improper inhaler technique is associated with poor asthma control and frequent emergency department visits. Allergy Asthma Clin Immunol 2013;9:8. Bateman, ED, Hurd SS, Barnes PJ, Bousquet J, Drazen JM, Fitzgerald M, et al. Global strategy for asthma management and prevention: GINA executive summary. Eur Respir J 2008;31:143-78. Nathan RA, Sorkness CA, Kosinski M, Schatz M, Li JT, Marcus P, et al. Development of the asthma control test: A survey for assessing asthma control. J Allergy Clin Immunol 2004;113:59-65. Lababidi H, Hijaoui A, Zarzour M. Validation of the Arabic version of the asthma control test. Ann Thorac Med 2008;3:44-7. Zorc JJ, Scarfone RJ, Li Y, Hong T, Harmelin M, Grunstein L, et al. Scheduled follow-up after a pediatric emergency department visit for asthma: A randomized trial. Pediatrics 2003;111:495-502. Lieu TA, Quesenberry CP Jr, Capra AM, Sorel ME, Martin KE, Mendoza GR. Outpatient management practices associated with reduced risk of pediatric asthma hospitalization and emergency department visits. Pediatrics 1997;100(3 Pt 1):334-41. Smith SR, Jaffe DM, Fisher EB Jr, Trinkaus KM, Highstein G, Strunk RC. Improving follow-up for children with asthma after an acute Emergency Department visit. J Pediatr 2004;145:772-7. Zeiger RS, Heller S, Mellon MH, Wald J, Falkoff R, Schatz M. Facilitated referral to asthma specialist reduces relapses in asthma emergency room visits. J Allergy Clin Immunol 1991;87:1160-8. Baren JM, Boudreaux ED, Brenner BE, Cydulka RK, Rowe BH, Clark S, et al. Randomized controlled trial of emergency department interventions to improve primary care follow-up for patients with acute asthma. Chest 2006;129:257-65. Al-Moamary MS, Alhaider SA, Al-Hajjaj MS, Al-Ghobain MO, Idrees MM, Zeitouni MO, et al. The Saudi initiative for asthma - 2012 update: Guidelines for the diagnosis and management of asthma in adults and children. Ann Thorac Med 2012;7:175-204.